Afrikaans: koffie | Albanian: kafe | Arabic: قهوة (qahua) | French: Café | Azerbaijani: qəhvə | Basque: kafea | Belarussian: кава (kava) | Bengali: কফি (kaphi) | Bosnian: kafa | Bulgarian: кафе (kafe) | Catalan: cafè | Cebuano: kape | Chichewa: khofi | Chinese: 咖啡 (Kāfēi) | Corsican: caffè | Croatian: kava | Czech: káva | Danish: kaffe | Dutch: koffie | Italian: caffè | German: Kaffee | Thai: กาแฟ (Kāfæ) | Sawahili: kahawa | Spanish: café | Portuguese: café | Turkish: kahveh | Croatian: kava | Lithuanian: kava | Polish: kawa (kava) | Slovakian: kava | Ukrainian: kavy or kava | Georgian: qava | Hungarian: kavé | Serbian: kafa | Slovenian: kave | Yiddish: kave | Filipino/Tagalog: kape | Hawaiian: kope | Indonesian: kopi | Korean: keopi | Malay: kawah or koppi | Sinhalese (Sri Lanka): kopi | Tamil (Sri Lanka): kapi-kottai or kopi. French: le thé | Swedish: te | Finnish: tee | Italian: tè | Danish: Te or The | Greek: τσάι (tsai) | Malay: teh | Portuguese: cha (pronounced ‘shah’) | Chinese: t’e, or ch’a | Persian: chaai | Urdu: Chai | Korean: cha | Russian: chay | Arabic: chai or shai | Bulgarian: chai | Croatian: caj (pronounced chai) | Dutch: thee | Afrikaans: tee | German: der Tee | Hebrew: teh | Hungarian: tea | Irish: tae | Indonesian: teh | Japanese: o-cha | Korean: cha | Latvian: teja (pronounced tay-ya) | Malay: teh | Maltese: te | Norwegian: te | Romanian: ceai | Sinhalese (Sri Lanka): thé | Spanish: el té | Swahili: chai (pronounced cha-i) | Taiwanese: de | Thai: chah (chah yen refers to iced tea) | Tibetan: cha or ja| Turkish: cay (pronounced chai) | Urdu: chai | (North) Vietnamese: che | (South) Vietnamese: tra (sometimes pronounced cha or ja) | Yiddish: tey Zulu: itiye. | Polish: herbata. Brazilian Portuguese: táxi | Croatian: taksi | Czech: taxík | Danish: taxi | Dutch: taxi | European Spanish: taxi | Finnish: taksi | French: taxi | German: Taxi | Greek: ταξί (taxí) | Italian: taxi | Japanese: タクシー (Takushī) | Korean: 택 (taegsi) | Norwegian: drosje | Polish: taksówka | European Portuguese: táxi | Romanian: taxi | Russian: такси (taksi) | Spanish: taxi | Swedish: taxi | Thai: รถรับจ้าง (thæ̆ksī̀) | Turkish: taksi | Ukrainian: таксі | Vietnamese: taxi | American English: cab. 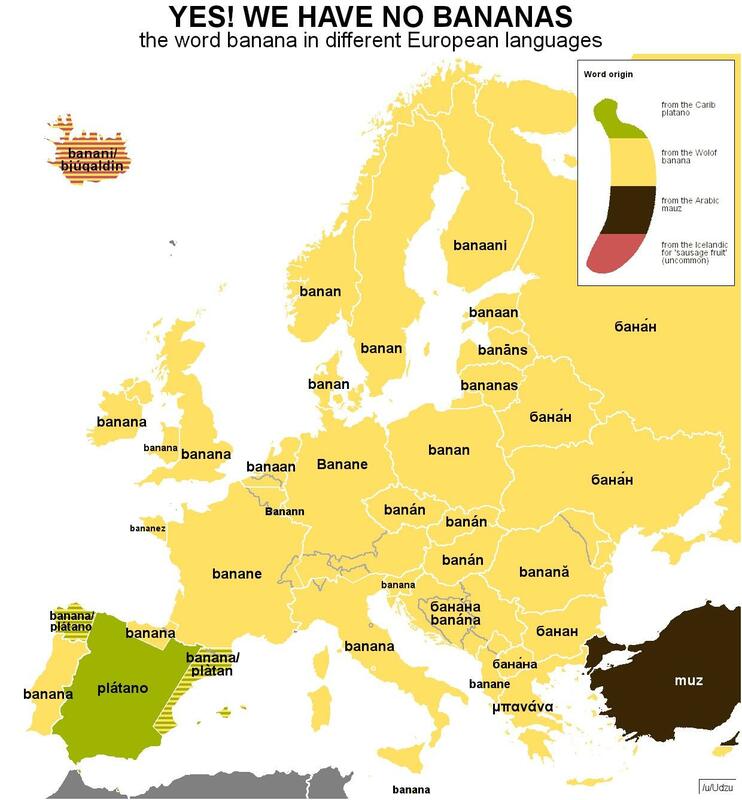 English: banana | Brazilian Portuguese: banana | Croatian: banana | Czech: banán | Danish: banan | Dutch: banaan | European Spanish: plátano | Finnish: banaani | French: banane | German: Banane | Greek: μπανάνα (banan) | Italian: banana | Japanese: バナナ (banana) | Korean: 바나나 (banana) | Norwegian: banan | Polish: banan | European Portuguese: banana | Romanian: banană | Russian: банан (banan) | Spanish: plátano | Swedish: banan frukt | Ukrainian: банан (banan). American English for taxi is taxi, cab, or taxi cab. Not so sure about that plátano in Spanish... many countries, including Costa Rica, where I live, use banano. banana you mean ? In Spain they indeed say plátano. 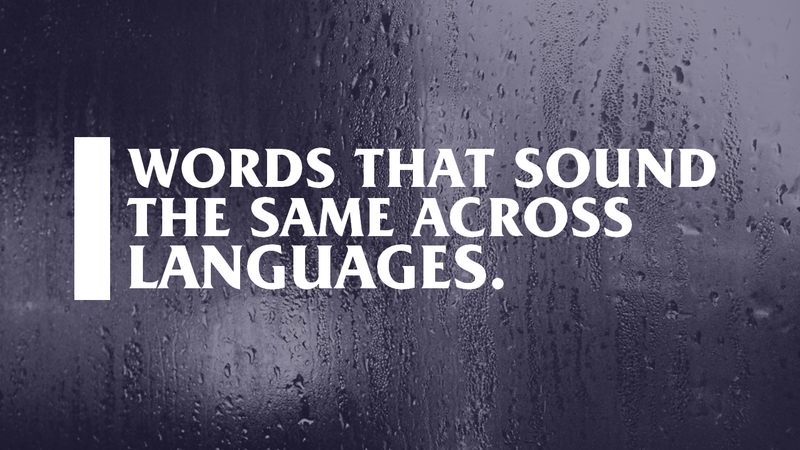 However some of the migrated languages have indeed adopted other words. In Brazil, pineapple is called 'abacaxí'.